Here’s an interesting revelation ... during the plague of Athens in 430 BC, the Greeks realized that people who had previously survived smallpox did not contract the disease a second time. In fact, these survivors were often called upon to attend to those afflicted with smallpox. One of the great services to humanity was the discovery of the vaccine. Without adaptive immunity, one fourth of the human race would have been terminally ill. Dr. Edward Jenner and Louis Pasteur Share this honorable credit. We call it the Digital Immune Ecosystem (DIE) because it is a complete comlex system of the most advance innovative thechnologies. We also call it The Cognitive Early Warning Predictive System (CEWPS™) because it is the intelligent immune system of the mission-critical systems. All viral attacks are recognized before triggering a grid-wide early warning alert. The Smart vaccine command center dispatches the proper vaccine to all systems on the grid. Once systems are immunized, the attack is deterred and normal operations resume. The attack episode is documented for future attacks. Leveraging medical knowledge that leads us to immunity vaccines, we can take a similar approach to launch a new chapter in enterprise systems immunity. The Smart Vaccine™ is the replication of the human immune system. The idea is fascinating and straightforward. Building a “defense by offense” mechanism to immunize any critical infrastructure or mission-critical enterprise system. This is the only way to outsmart cyber malware. 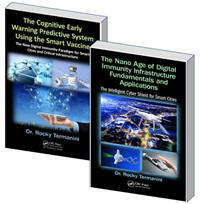 The Smart Vaccine™ is the commander in chief of the Cognitive Early Warning Predictive System (CEWPS™). This unique ecosystem was invented by Dr. Rocky Termanini. It couldn't have been a reality without the support and encouragement of my friends and students. © 2014 Copyright [MERIT CyberSecurity Group™]. All rights reserved.